Available from 12 pieces Short Production Time! 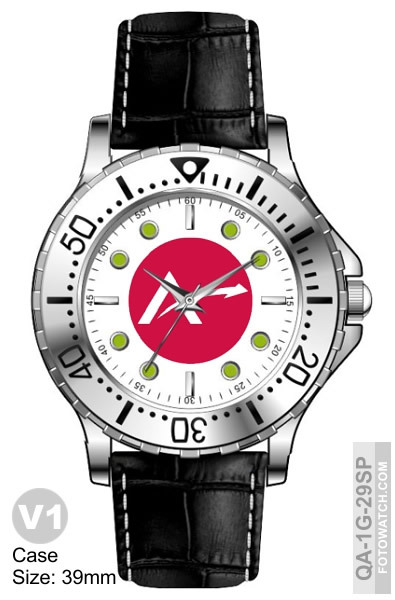 ...with A Classic Sporty Logo Watch for both Casual and Dressy Occasions. recipients of All Ages and Genders. Put your Organization's Logo, Name and/or Slogan on the Watch Dial and get the best Return of your Investment - because people look on average 30+ times a day at their watch - making it the top-leader at Cost per Expression -- period. Lets get started now ...It's Free. PLEASE NOTE: The watch face is fully customizable as per your wishes. Artwork & Printing Included from 200 Pieces! Detailed Price Quote Provided with E-Sample. Special Sale Pricing All Quantities. 15% Off Watch Price from 200 Pieces. Waived Artwork & Printing Charges from 200 Pieces (Your Savings - up to $250). 1 Free Watch for Every 100 Ordered. Order 100 Receive 101! using the most professional method of High Quality Screen Printing!" We will position your Logo and size it to be perfect -- placed on the Watch Dial. ONLY 12 pieces per model / gender -- Minimum Order Quantity. Experience with us Worry-Free Ordering. After filling out a form we will email you an e-Sample proof. Production will begin upon your artwork approval and order settlement! One Free Watch for Every 100 Ordered. Order 100 Watches and get 101 ! Order 200 and you get 202 - and so on! Fotowatch offers free e-Sample to help the customer in visualizing the logo watch. The e-Sample is a photo of your selected watch whose dial has been customized with your logo. It allows you to see exactly what your watch will look like at delivery - BEFORE you order! We welcome the opportunity to Exceed your expectations! We are so happy to inform you that the watches we received have fulfilled our expectations. Hope to get back to you for our orders in future. Received watches. They look great! I am going to need more mens watches, probably a dozen. How long would that take? Thank you for contacting me... The watches were a hit last year and I appreciate you providing them to our group. Yes, we did receive the watches. They look great...the players were excited to receive them. Thanks again for your help and patience!